The University of Wisconsin-Madison is one of the premier public research universities in the United States. Among all U.S. universities, public and private, Wisconsin ranks in the top six in recent evaluations of research activity and expenditures. In 2012, the university surpassed $1.16 billion in research spending. In the 2014 U.S. News & World Report ranking (the most recent), the UW-Madison Department of Chemistry ranked ninth among all U.S. programs. All five of the graduate paths that are ranked by U.S. News were listed among the top 10 programs by discipline: Analytical Chemistry (sixth), Chemical Biology (tied for second), Inorganic Chemistry (sixth), Organic Chemistry (eighth), and Physical Chemistry (eighth). Nineteen Nobel Prizes have been awarded to current or former UW-Madison faculty and alumni, including two chemistry alumni. 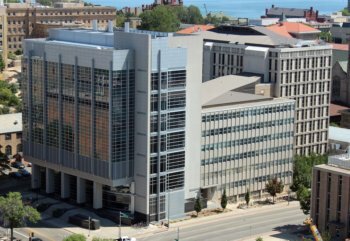 Elected members of the National Academy of Sciences, the National Academy of Engineering, and the National Academy of Medicine include more than 130 UW-Madison faculty members; six Department of Chemistry professors and professors emeriti are members of the National Academy of Sciences. The Department of Chemistry seeks to foster a community that welcomes and encourages diverse individuals and ideas. Several groups in the department seek to promote and maintain a welcoming environment for all department members; these groups include the Graduate Student-Faculty Liaison Committee (GSFLC), Students in Chemistry for Inclusive Representation (SCIRep), and the department's Climate and Diversity Committee. For decades, chemistry at Wisconsin has attracted outstanding undergraduate and graduate students, faculty, postdoctoral associates, and visiting scholars. This long and continuing tradition of excellence has many direct and indirect benefits for undergraduate and graduate students. In addition to having a broad choice of high quality courses, seminars, and research projects, students at all levels benefit from informal interactions with exceptional research scientists. The department also maintains a high-quality library, as well as first-rate instrumentation, shops, and laboratories. The department's reputation for excellence is nationally recognized by federal and nonprofit funding agencies, as well as corporate research sponsors. The mission of the Department of Chemistry at the University of Wisconsin-Madison is to conduct world-class, groundbreaking research in the chemical sciences while offering the highest quality of education to undergraduate students, graduate students, and postdoctoral associates. Our leadership in research includes the traditional areas of physical, analytical, inorganic, and organic chemistry, and has rapidly evolved to encompass environmental chemistry, chemical biology, biophysical chemistry, soft and hard materials chemistry, and nanotechnology. We pride ourselves on our highly interactive, diverse, and collegial scientific environment. Our emphasis on collaboration connects us to colleagues across campus, around the country, and throughout the world.